I’d been using a temporary tray for storing my brush, oil etc. for my Handi Quilter Sweet Sixteen. I didn’t realise it was temporary until it started to split apart! So it was time for a different solution. The real problem with the shelf underneath the Sweet Sixteen table is that it’s narrow and shallow — 9.75 x 2 inches (24.5 x 5 cm) MAXIMUM internal dimensions. It’s deep, so length isn’t an issue, but the height and width of whatever you put under there are critical. And you still need to leave enough space for your fingers to grab the storage tray too. I was in KMart (in Australia) and saw a neat little bamboo tray in the kitchen aisles. But as I wasn’t sure of the width of the shelf, I called my husband and got him to measure it. Unfortunately, the tray was too wide for the space. So I went looking a little more… And in the same KMart store, but in the stationery area, I found what I was looking for in the scrapbooking section — a tray with lots of fixed and removable dividers with lid that snaps closed. I only added a couple of removable dividers — I sure didn’t need the 30 (!) removable dividers that were included in the box (though if you’re a beader or scrapbooker, then maybe they’d be super useful). 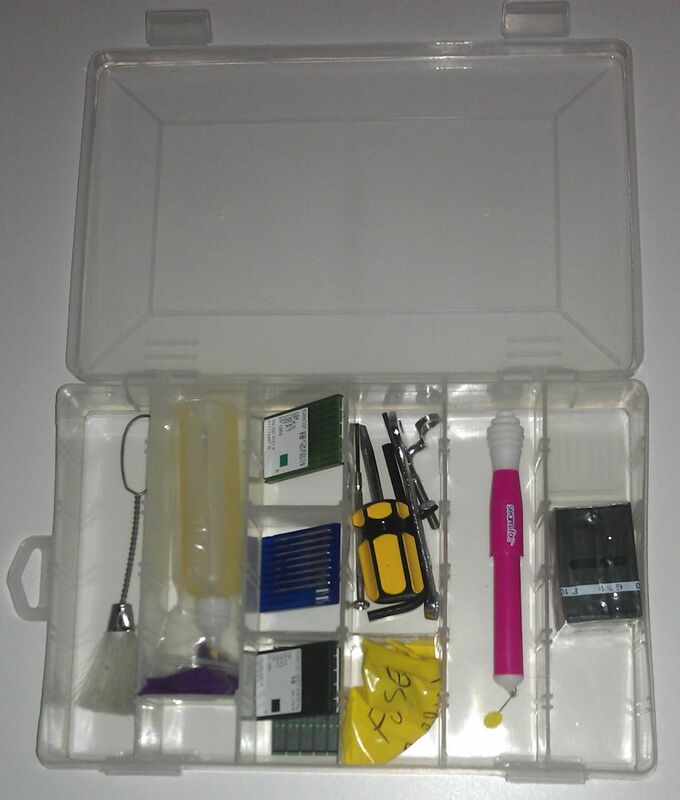 It’s a PERFECT tray for storing my oil, brush, small tools, spare fuse for the bobbin winder, and needles. And it cost me the princely sum of $5! Gotta be happy with that!